At the intersection of 11th and Milwaukee, lies the corner of change, the future heart of South Milwaukee. Locals say 'Da Crusher' was a hero around here. Artists are underway right now creating a bronze statue to honor wrestler Reggie 'Da Crusher' Lisowski after a local wrestling fan raised $40,000 in donations to have it made. He may be the most beloved person to ever come out of South Milwaukee, and companies are now stepping up to donate their services to create the park where the statue will be installed this summer. Chris Smith is the driving force behind The Crusher statue . 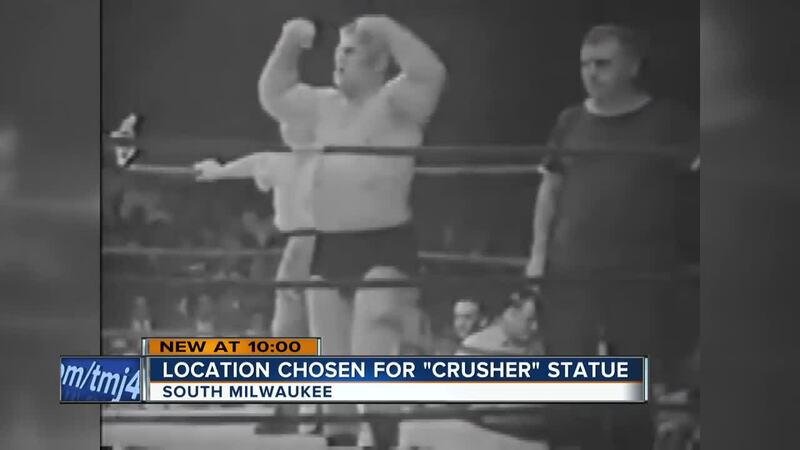 He's a big wrestling fan who wanted to honor The Crusher for his decades of success in the 1950s and 60s, a wrestler known worldwide as "the man that made Milwaukee famous." Smith said Lisowski "retired before wrestling really took off in the Hulk Hogan era. So, there's not a lot about him." Smith hopes to change that with the bronze statue but needed help to build the park where it will stand. Now companies, like KEI Landscapers are volunteering their services. Chris Kujawa with KEI says the company is happy to donate some of the trees, shrubs, and the labor. It will be a really nice project that the people of South Milwaukee will be happy with." Members of the local Bricklayers Union are in too because The Crusher was also a bricklayer. Tobin Boyle is with the local union and says there's "no shortage of volunteers that said they would be more than willing to help once we get rolling on this." Another member of the Bricklayers Union, Gary Burns, says it's a huge honor to be part of the project. Butch Miller with Miller Monument, knew Lisowski. He says The Crusher was approachable and never refused to sign an autograph or was standoffish. Miller Monument is donating the bricks, pavers, and cobblestones that will surround the new statue. Fans can get them personalized and the money will help pay for the big unveiling party. Miller says "it's a little cold now but come June, it's going to be a blast. This whole area is going to sparkle and look great!" Smith says it's "just amazing people are stepping up the way they have, continuing on from the people that have donated to the statue." People can order the personalized bricks now by clicking here .